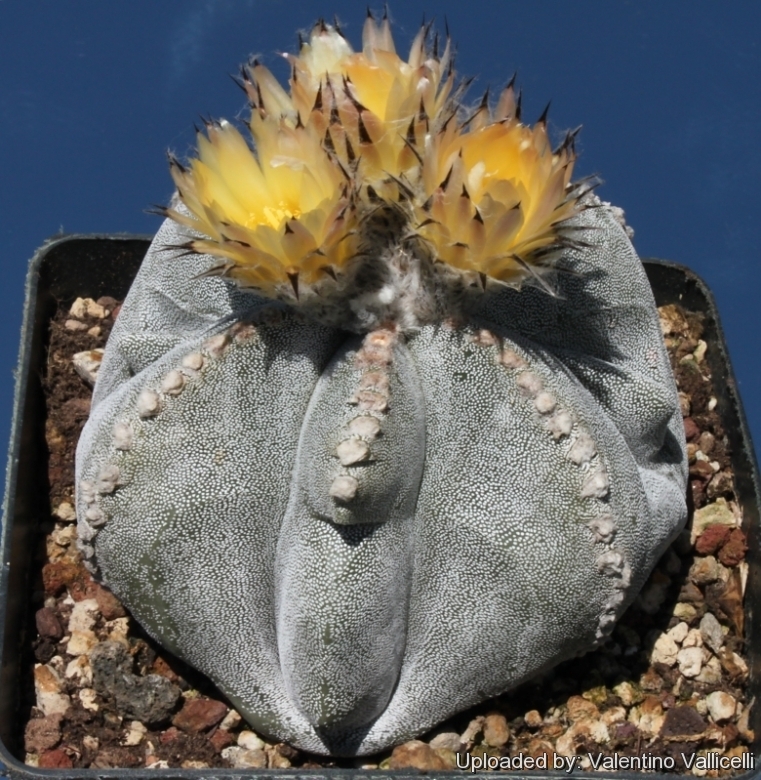 Description: Astrophytum myriostigma is a quite variable species and several breeds do exist. The "Irregular Ribs" is a rare form sought after for its unusual irregular, broken or branched ribs. In all other characteristics, namely size and shape of stems, flowers, fruits, roots etc. it is very similar to the standard species. Every plant is different and particular, and the form and shape of ribs varies with time. Habit: It is a spineless succulent plant, usually solitary or with very few basal branches. A transverse section of the stem reveal a perfect star shaped form (like the common star-fish). Stem: Globular to cylindric up to 60(-100) cm tall and 10-20 cm in diameter, bright green, covered with many minute white hairy scales that give it a characteristic chalk-white or silvery-grey appearance, but sometime naked. The scales are composed of very fine interwoven hairs, which, under a microscope, are very pretty object. Ribs: Usually 5, slightly spiralling, regular, deep, prominent, very broad and acute. Flowers: Funnelform, 4-7 cm long glossy yellow and sweet scented from the areole at the tip of the stem on mature plant. Outer perianth segments narrow, with brown scarious tips. Inner perianth segments numerous, oblong yellow with a silky shine. Scales on ovary tube scaroious, imbricated, very narrow often bristly tipped, with long wool in their axil. Blooming season: Flowers appear intermittently throughout the warm months from April to September. Plants may take up to six years to flower. Fruit: 2-2,5 cm in diameter, greenish to tannish-red, covered with brown, overlapping scales, with long wool in their axil. Seeds: Dark brown, helmet-shaped, shining, with a large depressed hilum, the margins being turned in. Remarks: This quite variable plant has been widely grown for years and is now available in several cultivated variety and several breeds do exist. The famouse “Onzuka” is only one of these and though maybe the most beautiful, but a lot of other forms are represented in many collections.